The exceptional thing about working with WordPress is the community that comes with it. People who love WordPress can almost always find enthusiasts nearby with the same passion, who want to learn or want to share their experience about the platform. 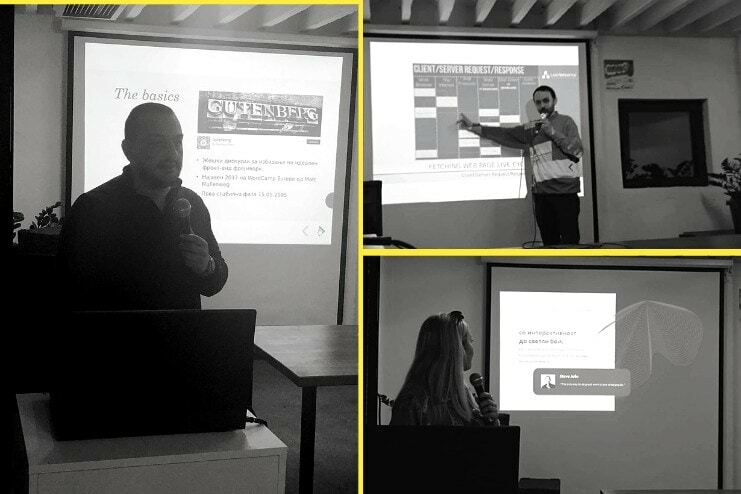 We are happy to share about our WordPress meetup No.13 that we held on 16 March in Public room, Skopje. The complete anatomy of the “Gutenberg Editor” was explained by Mitko Kockovski, an active member of the WordPress community with 10+ years of experience with WordPress, Word Camp traveler and our founder. In his talk, Mitko explained the new features coming with Gutenberg, and how we can extend the core functionality of the editor. The next topic “Increase your Websites Security” was very interesting part and we all had fun and learned very useful tips how to protect our and clients websites with Dalibor Sojic who has more than 15 years of experience in IT, mostly in network infrastructure and WEB application development. He gave us some tips and tricks on how to increase your WordPress website security. Whether we want to follow the trends and use them, we just have to know them. Biggest Graphics/Web and UX/UI Hits for 2019 collaborated by Rosana Stamenkova, Graphic / Web and UX / UI Designer & Developer at Alite International. Colors – they are one of the factors that can create the strongest emotional connection with users. You can use Multi-tons gradients, Bright shades, Overlay colors, Animated color effects. Subtle branding – More and more websites are opting for small logos of the home page. They use Sans Serif – Logo with text, Simple icons, Branding based on images. All these trends in the subtle branding comes down to one thing – creating experiences with which users want to get involved. Design with interactive elements to keep users engaged like Parallax slipping, gamification, video + text, audio.